There are only a few phone games that I actually committed to playing for long enough. I was actually playing Sims FreePlay on my new Android phone back then when my boyfriend urged me to download Tiny Tower. Lol. I was so surprised he was entirely addicted to a cute little game. It didn’t really appeal to me, but I downloaded it anyway to appease him. Of course, I ended up growing addicted and now I am the one who continues to play it, while he got bored and quit. Click here to see my full tower as of today (April 19)! I am not addicted anymore, but that’s because it’s been months now. But it shocks me that I am still checking up on it regularly! I personally am a sucker for 8 bit games. I do love my pixels. They are terribly appealing and cute to me. I should post more about that some other time! I am also a sucker for micromanaging games. Hence the previous addictions to Sims, RollerCoaster Tycoon, etc. 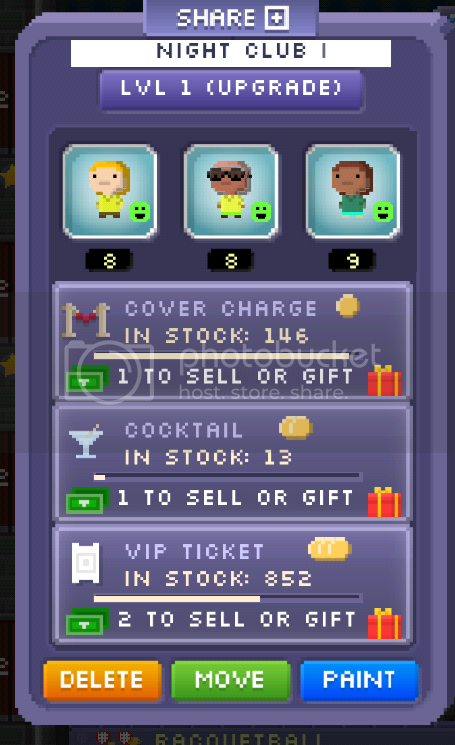 Anyway, Tiny Tower is pretty full of micromanaging at first when you get started, but after a while it gets repetitive like most micromanaging games are and you’re practically granted permission to stop checking it every 5 minutes and just check it once a day instead. 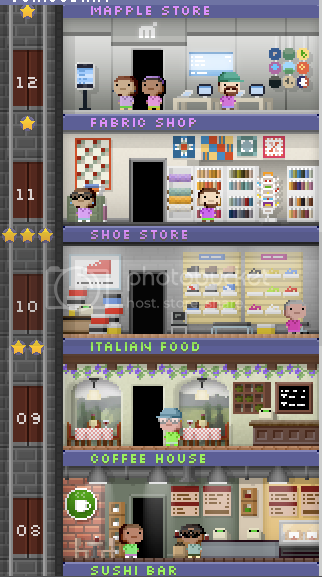 There are people who visit the tower and then people who work & live in the tower called Bitizens. You can evict them from their apartments or move new ones in and give them jobs at the different shops you have. They all have dream jobs, too, and if you’re lucky you’ll get a new shop with their dream job. And yes, I have someone who has a froyo shop as their dream job. With the money you earn, you can purchase new floors to build. You can build a very tall tower with many different floors. The reason I haven’t quit the game is because each floor is a surprise! You never know what kind of shop will be built and I think some of the shops are very cute and/or clever. Like the “Mapple” store… *cough*AppleStore*cough* The plumber shop has a green pipe with a piranha plant and what looks like Mario & Luigi’s costumes hanging in the back! How awesome is that! Each shop has 3 different items you can have in stock and sell. The first item is the cheapest, and the third item is the most expensive to restock, but it also earns you the most money, too. Some of the shops are truly dead on with what they would have in stock. I really like that. The stock for night clubs made me laugh! How realistic. They really do charge you a cover fee to get in. And then the cocktails in the club are always expensive as heck! And finally, a VIP ticket will get you better perks. Ha. My recent post Busy Busy Busy! You know, I've never actually tried a computer version of Sims. And I miiiight keep it that way because I can just imagine the addiction. Lol!